State trustees changed how they calculate what districts owe. That, combined with local early retirements and raises means the resulting bills are big. Amid all the talk about San Diego city schools’ budget problems in recent years, pensions come up a lot. San Diego Unified School District leaders have cited increasing pension payments as a major source of budget stress. Pension costs at San Diego Unified rose from $90 million in fiscal year 2016, to almost $120 million this year. Contributions are expected to rise to $136.5 million in 2019 and $153.6 million in 2020. In a survey of other large districts in the region, VOSD found many are also feeling the strain as they see their pension payments rise by seven-figures year after year. Pension bills are escalating for public schools across California, thanks in part to changes made by board members at the two state pension funds known as CalSTRS and CalPERS. To improve the long-term health of the pension funds, pension system board members recently lowered long-term investment earnings expectations. They also enacted plans to reach full funding at both systems in the coming decades. Those moves escalated employer pension payments. For public school employees, defined benefit pensions are supposed to work like this: Money contributed by employers and employees is invested by the state pension systems. Over time, the money earns enough to provide guaranteed pension checks to retirees for life. For teachers, the state also kicks in money. But there’s been trouble with that formula. People are living longer, requiring more money than previously anticipated. Investments took major hits in the Great Recession and pension systems have struggled to regain footing. Even a great year of investment gains doesn’t solve the problem, because there is less money to reap the rewards when they come. School districts, and thus taxpayers, are on the hook when things don’t go according to plan. And local district decisions can also add to the problem. This happens when early retirement incentives, like the ones given to 1,128 San Diego Unified employees last spring, turn workers into retirees sooner than planned. Since pensions are paid out as a percent of salary, employee raises also increase pension costs. San Diego Unified leaders awarded across-the-board raises of 4 percent in late 2016, just before grappling with $124 million in budget cuts last school year. The move also added millions to the district’s budget deficit. Other large districts in the county are also grappling with pension payments growing by millions of dollars annually. At Grossmont Union High School District, pensions cost the district more than $17 million last year, $18.6 million this year and are expected to reach $24.6 million in 2020. Grossmont’s deputy superintendent Scott Patterson said it’s a concern. “The ever increasing payments to the pension programs are consuming an increasing share of the District’s budget without a specific funding source to offset these increases. This will continue to put pressure on the District’s instructional programs,” Patterson said in a statement. Vista Unified’s financial chief Donna Caperton echoed those concerns. Costs there were less than $16 million in 2016, according to district records. They will total nearly $30.5 million this year. At Poway Unified, total pension costs rose from $23 million in 2016, to $30 million this year. Payments from the general fund are expected to rise to $37 million in 2019 and $41 million in 2020, not including payments from other district funds. 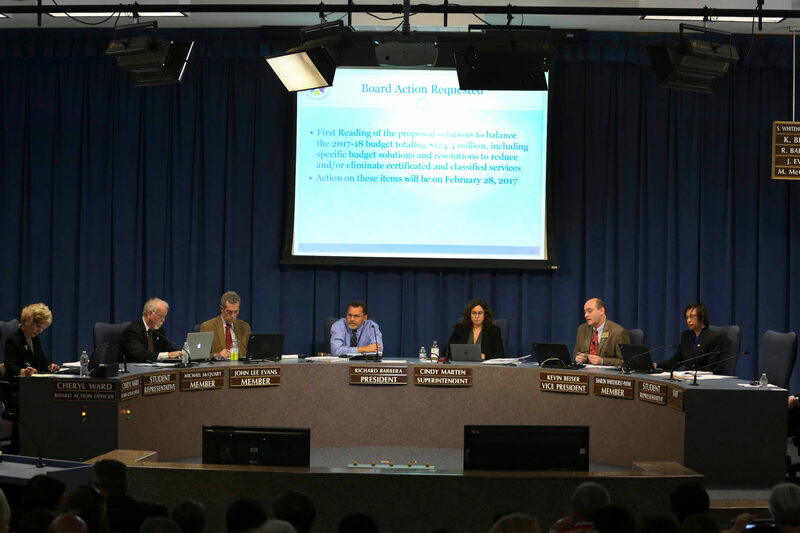 Chula Vista Elementary School District officials did not provide pension costs for 2017 through 2020, despite multiple requests since Jan. 10 for the amounts. But spokesman Anthony Millican said higher costs are having an impact. Aside from annual pension payments, there’s another picture of the burgeoning pension problem looming on government balance sheets. Local government agencies are now required to disclose their share of CalSTRS’ and CalPERS’ unfunded pension debt, or net pension liability, in their financial documents. The state’s large pension funds have $116 billion less than they have promised in benefits to school employees. That’s up from $100.6 billion the year before, according to CalSTRS and CalPERS records for last fiscal year. The majority, $92.5 billion, is missing for teachers in CalSTRS. At the local level, the region’s six largest public school districts are reporting higher and higher unfunded pension liabilities. All of them exceed $200 million each. At San Diego Unified, the largest school district in the county, unfunded pensions reached $1.3 billion last fiscal year, up from $1.09 billion the year before. To put that in perspective, the San Diego Unified’s entire general fund budget is about $1.3 billion to $1.4 billion a year. On a per pupil basis, San Diego Unified’s unfunded pension debt comes out to more than $10,500 for each of the district’s 128,000 enrolled students in 2017. Here’s how the unfunded pension debt numbers have grown in the last two years at the largest school districts in San Diego County, according to district documents and officials. Sweetwater’s unfunded pension liability was $368 million in 2016. Martens said 2017 numbers were not yet available. Unlike some other pension funds, California public school districts cannot decrease their own unfunded liabilities by contributing more than required annually. Any extra payments made would instead go into the larger pool of funds shared by all public school districts. And unfunded pension debt is expected to continue to grow, despite increasing contributions. At CalSTRS, the unfunded pension debt numbers will worsen for at least 10 years, before shrinking to zero when the system reaches full funding in 2046, system officials wrote in a recent funding risk report. That’s if all the projections are correct and all investment targets are met. At CalPERS, annual payments are calculated with the goal of reaching full funding in 30 years, though system officials are currently exploring shorter timeframes. Shortening the timeline could make contributions year to year more volatile, but would increase pension benefit security, and also lessen the amount of old debt passed on to future generations, according to CalPERS officials.